I’m by no means an expert on Regular Expressions. I mean, I get what they do, and can see their awesomeness, but damn they do my head in sometimes. To help myself out, I wrote a quick little Flex app that lets you test how a regular expression will work with a particular string. It lets you try out all the Flash Regular Expression methods and see each of the results. To top it all off, I put together a quick overview of the different Flash Regular Expression methods that are available, as well as a short overview of the Regular Expression syntax. If there is no match then this will return null. Replaces the pattern in the string with the replacement string. 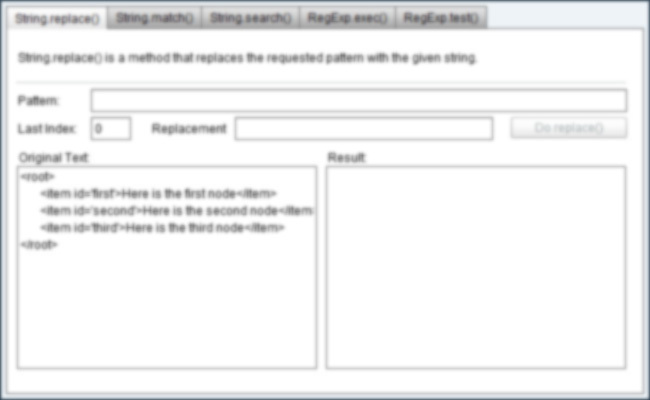 Returns the index of where the pattern is found in the string. Returns an Array populated with values relating to the pattern. Here is a quick run-through of the regular expression syntax as a bit of reference. There are two ways to set up a regular expression. Construct it like any type of object, passing in a string of the pattern and the flags as parameters. Flags change the way the regular expression works. They also can effect the results of the regular expression methods in different ways. Meta Characters are characters that have a special meaning when used inside a Regular Expression pattern. If using ‘multiline’ (m) then it will match the start of a line. If using multiline (m) then it will match the end of a line.
. (period) Matches any single character. If using the ‘dot all’ (s) flag this will match new lines as well. * Matches the previous character 0 or more times. + Matches the previous character 1 or more times. Meta Sequences are special string that can be used to represent specific characters in a pattern. \b Matches the position between a word character and a non-word character. If first or last character in the string is a word character, also matches the start/end. \B Matches the position between 2 word characters. Also matches the position between 2 non word characters. Normally quantifiers like * and + are greedy, as in, they will try and match as much as they can. They can be made lazy by adding a ? afterward. Sometimes when you are looking for a pattern in a string you need to work with a sub-string. Maybe it is to replace it, or reference it is a new string. Maybe you don’t know what exactly it is you have to match. That’s where this stuff comes in. Sometimes you don’t want a group to be captured for back references, etc. This is can be done by adding ? : at the start of the group. When used in RegExp.exec(), the group will be stored under a property with the ‘name’. Note: this is an AS3 only Regular Expression syntax. Here are some links to some sites that help with regular expressions. Congratulations! Great example. The source code of this application is open? Great post and app too. it’s really handy while trying out new expression. i use it a lot! thanks! Cool tool, but it doesn’t seem to work for unicode characters. /\u00E9/g is not finding any occurrence of ‘é’ in my text. Very helpful. It made me realize that a typed return character (\r) is not the same as \n. Flash should be here somewhere?